Pavi's Platter: Chinese Chicken Fried Rice ! Its very first chinese dish for the blog.. though i make it now and then didnt get time to take step wise pictures. I tried my best to find some authentic chinese dishes from books and other blogs and finally came up with this fried rice. Though i missed one main ingredient Oyster sauce. Heat a pan and add 1 tbsp of oil. Once oil is hot add the diced chicken breast. Add salt and pepper and keep cooking. Drizzle some dark soy sauce and once chicken is cooked well transfer them to a plate and keep aside. Break the eggs in the same pan and scramble them. Do not make them into tiny pieces. Once cooked transfer them and keep aside. In the same add some more oil and throw in the sliced onions. Once transparent add the green peas and saute for few minutes. Add the broccoli florets and fry them for a while sprinkling some salt. Remove them in a plate and keep aside. You can also add green spring onions instead of pink. Now that everything needed for the fried rice is ready, we just need to mix them all and fry them together. Add the remaining oil in the pan (preferably a wok) and add the cooked rice. 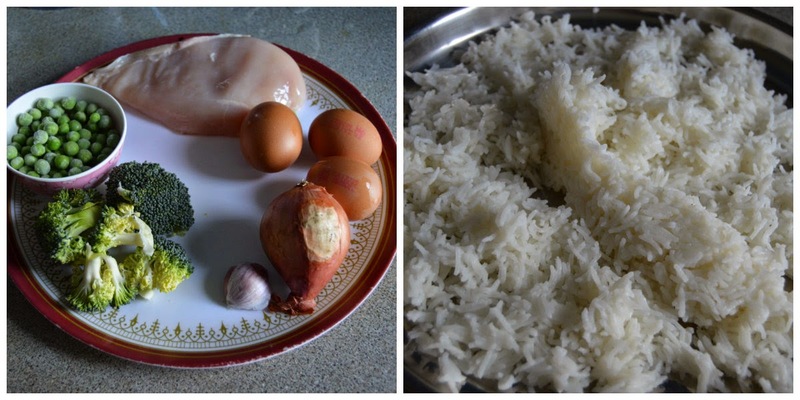 Fry the rice for 3 - 4 minutes and then add the eggs and mix it well with the rice. Now add the chicken and the onion peas broccoli to the rice and mix them well and keep frying in high heat for 2 minutes. Sprinkle some crushed pepper and add the light soy sauce and mix them well. Traditional Chinese fried rices have Oyster sauce as their main ingredient. However i didn't add it. Transfer to a serving bowl and serve with any chinese gravy dish or just chilli/ tomato sauce.